Arthur C. Clarke once observed, "Any sufficiently advanced technology is indistinguishable from magic" (Profiles of the Future, Harper & Row, 1973; this third "law" was added to an original two published in the earlier 1962 edition). Consider an all-knowing demon bound by a spell into an amulet or a communicator that provides an instantaneous link to the Encyclopedia Galactica answer desk. Both describe things that you can wear on a chain around your neck that can answer any question you ask. The border between SF and Fantasy is indistinct at best - for example, Stephen King's The Stand has very strong fantasy/mystical elements embedded in a purely SF post-holocaust plot. This distinction is even more blurred in children's SF, where the science in science fiction is never allowed to get in the way of the plot. Consider Oliver Butterworth's The Enormous Egg (Boston: Little, Brown; 1956 hardback, $10 in good ex-lib with DJ): a common chicken lays the titular egg, which then hatches into a baby triceratops - accompanied by only a small amount of hand waving concerning the theoretical relationship between dinosaurs and birds. Or Eleanor Cameron's popular Mushroom Planet series that begins with The Wonderful Flight to the Mushroom Planet (Boston: Little, Brown; 1954 hardback, $20 for later printing good ex-lib with DJ, $50+ for non-ex-lib later printing with DJ, $100+ for first printing in DJ - a very good signed later printing non-ex-lib sold on eBay recently for $75): two young boys build a rocket ship in response to a mysterious classified ad, and with a little magical technology from Mr. Bass, Chuck and David (and their chicken, Mrs. Pennyfeather - maybe I should do a theme article on chickens in SF?) are soon on their way to the invisible planet of Basidium. 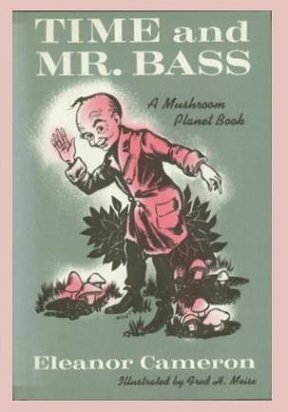 By the fifth book, Time and Mr. Bass (Boston: Little, Brown; 1967 hardback) the story line has veered decidedly towards fantasy and mythology. "... with [children's] books published in the 1940s, 1950s and early 1960s, ex-library is often all there is to be found." Also, for a BookThink discussion of recent children's SF and fantasy literature, see "Collecting and Selling Children's and Young Adult's Modern Science Fiction and Fantasy." But if advanced technology can seem magical, what about the reverse? A corollary to Clarke's Third Law could read, "Any sufficiently advanced magic is indistinguishable from technology." In the remainder of this article, I will examine titles in which the rigorous development of an internally consistent body of governing rules elevates magic to a state akin to science. 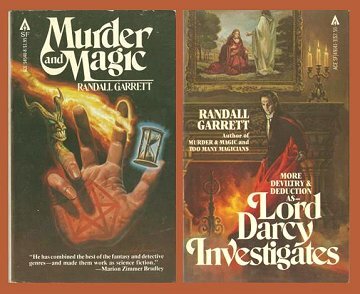 Perhaps the finest example of scientific magic is found in Randall Garrett's Lord Darcy series. Set in an alternate universe, Richard the Lion-Hearted survives the crossbow wound he received during the siege of Chalus in 1199 and lives to rule a combined English-French Plantagenet empire � one in which the systematic development of magic science flourished. Chief Criminal Investigator Lord Darcy, along with his forensic sorcerer Sean O'Lochlainn � cf. Holmes and Watson � are called upon to solve a multitude of mysteries, using logic and the latest in practical magic technology. Jim Butcher, The Dresden Files series. From the author's website: "The Dresden Files are set in a 'alternate' Chicago where magic is real, but only a few actually believe in it; it's a first-person tale told by an irascible wizard named Harry Dresden, who regularly gives the magical establishment indigestion - and the police, the same. Take Sam Spade, your Average Joe Underdog Action Star, and toss in some spell craft, and you get Harry Blackstone Copperfield Dresden. Heck of a guy." The SciFi Channel has announced an upcoming series based on the Dresden novels, which could boost the popularity of the series. Individual paperback titles in F (fine) condition seem to sell pretty readily at $2 to $4, but a better bet is lots of 5 to 7 PBs, which can bring in $30+. Later titles starting with Dead Beat were first published in hardback. Look for the SFBC omnibus edition of Wizard For Hire, which collects books 1 to 3 ($20). The future may see re-issues of the earlier titles in trade hardback.